Summary: Sst interneurons play a vital role in controlling information flow in the brain when we are awake and alert, researchers report. Specialized nerve cells, known as somatostatin-expressing (Sst) interneurons, in the outer part of the mammalian brain (or cerebral cortex) — play a key role in controlling how information flows in the brain when it is awake and alert. This is the finding of a study published online in Science March 2 by a team of neuroscientists at NYU Langone Medical Center and its Neuroscience Institute. “We have long wondered how the cerebral cortex can process and integrate separate information lines coming in from different brain structures, or from other areas of the cortex, and how it sorts out what information is relevant at any given moment,” says senior study investigator Bernardo Rudy, MD, PhD. 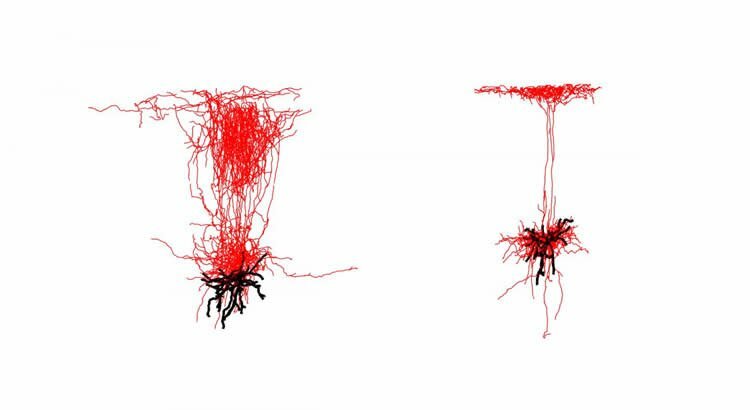 “We now know that Sst interneurons operate like a switchboard that controls the flow of these information lines,” adds Rudy, a professor of neuroscience and physiology at NYU Langone. According to Rudy, who is also the Valentino D.B. Mazzia, MD, JD, Professor of Anesthesiology in the Department of Anesthesiology, Perioperative Care, and Pain Medicine, neurons in the cortex are known to play a key role in sensory perception, memory formation, and learning. But the new study, he says, is the first to show the “switchboard” role played by Sst interneurons in the cortex. Because the mouse and human brains have much in common, co-lead study investigator William Muñoz, an MD-PhD student at NYU Langone, says the team’s findings advance the field’s understanding of how the brain processes touch, smell, hearing, sight, and taste. The results, adds Muñoz, may also speed the search for drug therapies for conditions where the senses are disrupted, including Alzheimer’s, schizophrenia, and autism. Different Sst interneurons, or type of nerve cell (colored red), in the outer shell, or cerebral cortex, of the mouse brain are shown. NeuroscienceNews.com image is courtesy of Science. Besides Rudy, Muñoz, and Tremblay, another co-investigator involved in the study is Daniel Levenstein, MS, a doctoral student at NYU Langone. Funding: Funding support for the study was provided by National Institutes of Health grants R01 NS30989, R21 NS093987, P01NS074972, and F31 NS087919, as well as a graduate research fellowship from the Natural Sciences and Engineering Research Council of Canada. Image Source: NeuroscienceNews.com image is courtesy of Science. NYU Langone Medical Center “New Mechanism to Control Information Flow in the Brain.” NeuroscienceNews. NeuroscienceNews, 2 March 2017. NYU Langone Medical Center “New Mechanism to Control Information Flow in the Brain.” http://neurosciencenews.com/information-flow-neuroscience-6187/ (accessed March 2, 2017). T’is natural in animals, deprogrammed socioculturaly in modern society.